LEWCO PLV19 Collapsing Width Conveyor - LEWCO Inc. The customer was presented with the challenge of ergonomically accessing all four sides of light weight sheet metal products that were lacking real structural integrity. The parts ranged from 5” wide to 60” wide, and from 59” to 80” long, in a ten cell assembly line. Together, we developed a 24VDC driven PLV19 powered roller conveyor, dual laned (interlaced), on sliding rails. This allowed the conveyor to be collapsed for narrow products, and extended for wider products. Additionally, because the product couldn’t tolerate much more than a 12” gap in length, these conveyor units had a pneumatically controlled drop down gate on one end to allow it to be lowered for personnel to pass through, or raised to conveyor level to convey the product across the 30” gap. 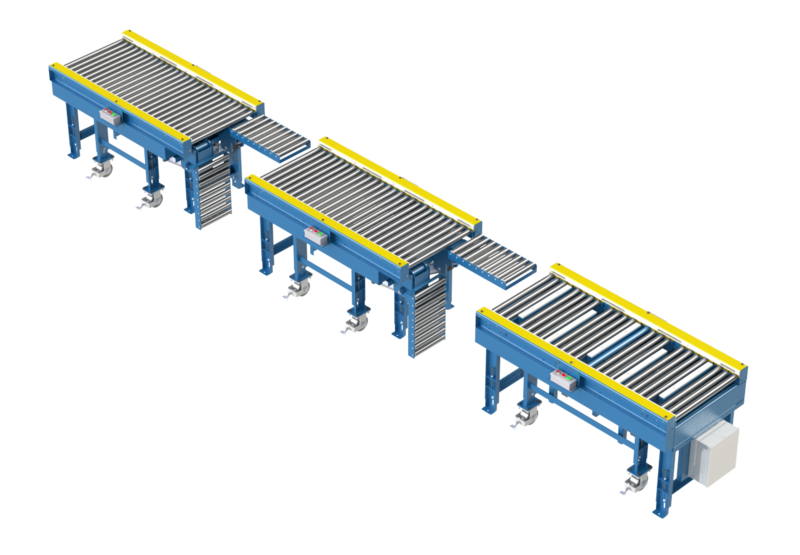 Furthermore, two of the workstations required the product to be lifted 12” above the rollers, in any width position, to interface with their existing automation. PLV19 was chosen because of the durability compared to round urethane belts. Also, low noise and less maintenance compared to chain and sprockets. 24VDC drives for economical operation. Orange urethane sleeves for non-marking and reduced noise compared to plain steel rollers. The customer integrated their automation controls with this conveyor system to achieve the desired results.